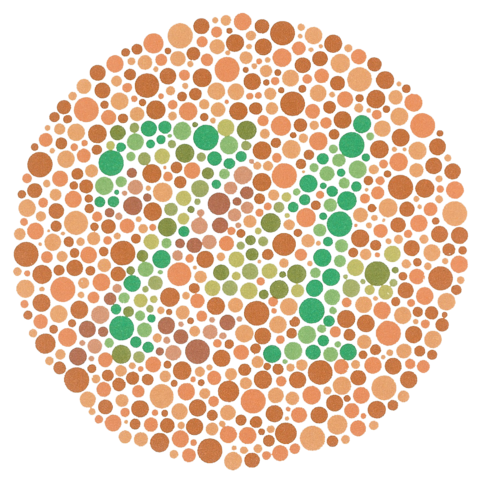 0 Can red-green colour-blind people play cricket? Published 28th May 2013 by Jon Scaife & filed under Uncategorised. Whilst grumbling to myself about the end of play (due to light) last night, a thought sud­denly occurred to me — with a red ball and a green pitch, can red-green col­our-blind people play crick­et suc­cess­fully? I can’t ima­gine why bowl­ers would be too badly effected, but bat­ting and field­ing could prove more dif­fi­cult. With a sight-screen any dif­fi­culties should be reduced, and a lot of catches in the field have the sky as a back­drop, but there will still be occa­sions where the ball must be more dif­fi­cult to pick out. So, are many of the play­ers at the highest level col­our-blind? It appears that the Aus­trali­ans have beaten me to it, and already done the hard graft to provide an answer to this ques­tion. The con­clu­sion: at most levels col­our-blind people are rep­res­en­ted in line with their num­ber in the pop­u­la­tion (around 10%), but at the very highest levels there are almost no col­our-blind people at all (Bill Ponsford may be an excep­tion to the rule. This Aus­sie legend played 29 test matches at an aver­age of 48). It seems that at the very highest levels being col­our-blind is a sig­ni­fic­ant imped­i­ment. At all levels, play­ers with col­our-blind­ness found it dif­fi­cult to see the ball across the grass and ten­ded to avoid mid and deep field­ing pos­i­tions — cap­tains take note! Oth­er stud­ies have shown that col­our-blind bats­men are not sig­ni­fic­antly affected, for example hav­ing an aver­age play­ing with a white ball no dif­fer­ent from their aver­age with the red ball. So, it seems that whilst we’re not likely to find many col­our-blind inter­na­tion­al test play­ers, if you’re col­our-blind and want to get down to the loc­al club on a week­end, go and get stuck in! You could also invest in a pair of Oxy-Iso glasses, which appar­ently enhance reds and greens! I should also say, there are sev­er­al dif­fer­ent con­di­tions that fall under the blanket name “red-green col­our-blind”, namely protan­op­ia, deu­ter­an­op­ia, protan­om­aly, and deu­ter­an­om­aly. If you think you may have one of these con­di­tions but haven’t been dia­gnosed, please speak to your doc­tor (before or after the game) — we’re a crick­et­ing web­site not a med­ic­al one! Home » Uncategorised » Can red-green colour-blind people play cricket?